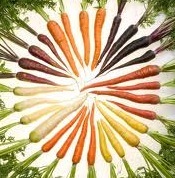 Carrots are rich in carotenoids, vitamins B1, B3, B6, C, E, K biotin, folate, calcium, magnesium zinc, potassium and fiber. Beta-carotene, a carotenoid found in carrots, has been found to reduce some cancer rates, by 50%. Carrots are important for eye health. Lutein and zeaxanthin are two carotenoids that protect the eyes from macular degeneration and cataracts. Carrots have also been found to reduce high cholesterol levels as well. Eating two carrots a day can help reduce your cholesterol levels. I love to have my carrots raw, I use them in salads and they are also great for juicing. If juicing, remember not to use a lot of them, specially if the juicing method you are using is removing the fiber, because this increases the glucose concentration.